The Farmville, VA area has had 4 reports of on-the-ground hail by trained spotters, and has been under severe weather warnings 10 times during the past 12 months. 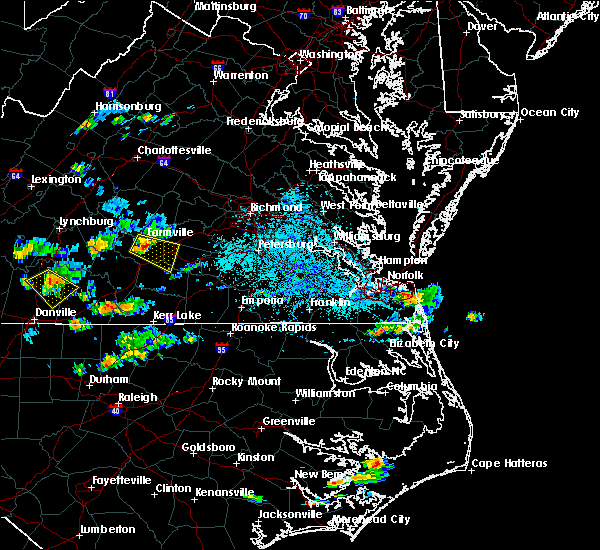 Doppler radar has detected hail at or near Farmville, VA on 35 occasions, including 3 occasions during the past year. 4/19/2019 6:08 PM EDT At 608 pm edt, a severe thunderstorm capable of producing a tornado was located over longwood university, moving north at 50 mph (radar indicated rotation). Hazards include tornado. Flying debris will be dangerous to those caught without shelter. mobile homes will be damaged or destroyed. damage to roofs, windows, and vehicles will occur. tree damage is likely. this dangerous storm will be near, guinea mills around 625 pm edt. cumberland around 630 pm edt. Other locations impacted by this tornadic thunderstorm include kingsville, raines tavern, trents mill, reeds, grays siding, ashby, oak forest, bear creek lake state park, stoddert and mcrae. 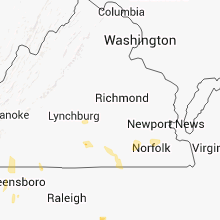 4/19/2019 6:00 PM EDT At 559 pm edt, a severe thunderstorm capable of producing a tornado was located near hampden sydney college, moving north at 50 mph (radar indicated rotation). Hazards include tornado. Flying debris will be dangerous to those caught without shelter. mobile homes will be damaged or destroyed. damage to roofs, windows, and vehicles will occur. tree damage is likely. this dangerous storm will be near, hampden sydney around 605 pm edt. farmville around 615 pm edt. Other locations impacted by this tornadic thunderstorm include kingsville, briery creek lake, tuggle, briery and worsham. 4/19/2019 5:46 PM EDT At 545 pm edt, a severe thunderstorm capable of producing a tornado was located near drakes branch, or near keysville, moving northeast at 45 mph (radar indicated rotation). Hazards include tornado. Flying debris will be dangerous to those caught without shelter. mobile homes will be damaged or destroyed. damage to roofs, windows, and vehicles will occur. tree damage is likely. this dangerous storm will be near, hampden sydney college around 605 pm edt. hampden sydney around 610 pm edt. 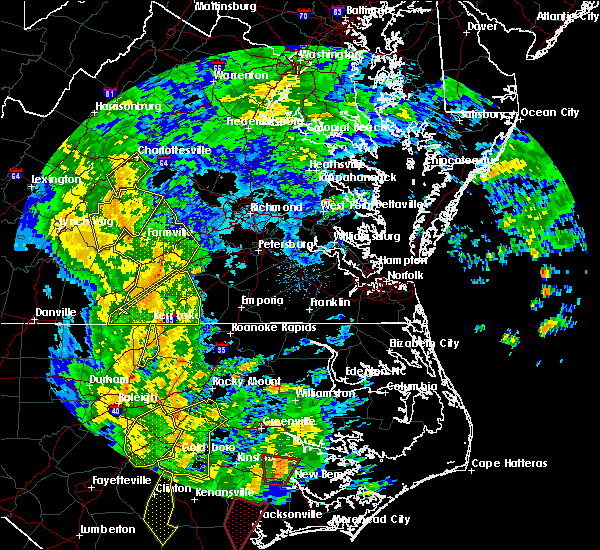 farmville and longwood university around 615 pm edt. Other locations impacted by this tornadic thunderstorm include kingsville, briery creek lake, tuggle, briery, virso, moran, simplicity, worsham and meherrin. 8/19/2018 5:23 PM EDT At 523 pm edt, a severe thunderstorm was located near rice, or near hampden sydney college, moving southeast at 20 mph (radar indicated). Hazards include 60 mph wind gusts and quarter size hail. Minor damage to vehicles is possible. expect wind damage to trees and powerlines. this severe storm will be near, green bay around 535 pm edt. burkeville around 545 pm edt. crewe around 555 pm edt. Other locations impacted by this severe thunderstorm include prince edward station, jennings ordinary, prince edward lake, twin lakes state park, oliveville, burkes tavern, moran and rubermount. 8/19/2018 5:09 PM EDT At 509 pm edt, a severe thunderstorm was located over hampden sydney college, moving southeast at 20 mph (radar indicated). Hazards include 60 mph wind gusts and quarter size hail. Minor damage to vehicles is possible. expect wind damage to trees and powerlines. this severe thunderstorm will be near, rice around 525 pm edt. green bay around 535 pm edt. burkeville around 545 pm edt. crewe around 555 pm edt. Other locations impacted by this severe thunderstorm include kingsville, briery creek lake, prince edward station, jennings ordinary, prince edward lake, twin lakes state park, oliveville, burkes tavern, scholfield and moran. 6/22/2018 5:55 PM EDT The severe thunderstorm warning for western prince edward county will expire at 600 pm edt, the storm which prompted the warning has weakened below severe limits, and no longer poses an immediate threat to life or property. therefore, the warning will be allowed to expire. however heavy rain is still possible with this thunderstorm. to report severe weather, contact your nearest law enforcement agency. they will relay your report to the national weather service wakefield. 6/22/2018 5:43 PM EDT At 543 pm edt, a severe thunderstorm was located over hampden sydney, moving north at 30 mph (radar indicated). Hazards include 60 mph wind gusts. Expect damage to trees and powerlines. Locations impacted include, farmville, longwood university, hampden sydney, hampden sydney college, prospect, darlington heights, kingsville, briery creek lake, tuggle, elam, allens mill and worsham. 6/22/2018 5:19 PM EDT At 519 pm edt, a severe thunderstorm was located near keysville, moving north at 35 mph (radar indicated). Hazards include 60 mph wind gusts and quarter size hail. Minor damage to vehicles is possible. expect wind damage to trees and powerlines. this severe thunderstorm will be near, darlington heights around 530 pm edt. hampden sydney college around 535 pm edt. hampden sydney around 540 pm edt. longwood university and prospect around 545 pm edt. farmville around 550 pm edt. Other locations impacted by this severe thunderstorm include kingsville, briery creek lake, tuggle, elam, briery, allens mill, worsham and simplicity. 5/22/2018 9:20 PM EDT The severe thunderstorm warning for prince edward and northwestern lunenburg counties will expire at 930 pm edt, the storm which prompted the warning has weakened below severe limits, and no longer poses an immediate threat to life or property. therefore the warning will be allowed to expire. 5/22/2018 8:43 PM EDT At 842 pm edt, a severe thunderstorm was located over madisonville, or near red house, moving east at 35 mph (radar indicated). Hazards include 60 mph wind gusts. Expect damage to trees and powerlines. this severe thunderstorm will be near, hampden sydney around 900 pm edt. hampden sydney college around 905 pm edt. green bay around 915 pm edt. Other locations impacted by this severe thunderstorm include briery creek lake, tuggle, prince edward station, briery, arvins store, twin lakes state park, allens mill, nutbush, burkes tavern and scholfield. 4/15/2018 8:58 PM EDT The severe thunderstorm warning for southeastern cumberland. southeastern prince edward. northwestern lunenburg. northwestern nottoway and western amelia counties will expire at 900 pm edt. the storm which prompted the warning has weakened below severe limits. therefore, the warning will be allowed to expire. However heavy rain is still possible with this thunderstorm. 4/15/2018 8:40 PM EDT At 840 pm edt, a severe thunderstorm was located near jetersville, or 8 miles northwest of crewe, moving northeast at 50 mph (radar indicated). Hazards include 60 mph wind gusts. Expect damage to trees and powerlines. this severe storm will be near, morven around 855 pm edt. other locations impacted by this severe thunderstorm include raines tavern, prince edward station, angola, arvins store, twin lakes state park, nutbush, hawk, maplewood, meherrin and deatonville. A tornado watch remains in effect until midnight edt for central and south central virginia. 4/15/2018 8:24 PM EDT At 823 pm edt, a severe thunderstorm was located near green bay, or near victoria, moving northeast at 60 mph (radar indicated). Hazards include 60 mph wind gusts. Expect damage to trees and powerlines. this severe thunderstorm will be near, burkeville around 830 pm edt. crewe and rice around 835 pm edt. jetersville around 840 pm edt. amelia courthouse and morven around 850 pm edt. other locations impacted by this severe thunderstorm include raines tavern, prince edward station, angola, arvins store, twin lakes state park, nutbush, hawk, maplewood, meherrin and deatonville. A tornado watch remains in effect until midnight edt for central and south central virginia. 4/15/2018 8:09 PM EDT At 807 pm edt, severe thunderstorms were located along a line extending from near crozet to near lake monticello to new canton to near cumberland, moving northeast at 45 mph (radar indicated). Hazards include 60 mph wind gusts and nickel size hail. Expect damage to trees and powerlines. these severe storms will be near, lake monticello around 815 pm edt. palmyra and troy around 820 pm edt. kents store around 825 pm edt. fife around 830 pm edt. other locations impacted by these severe thunderstorms include raines tavern, angola, oak forest, shores, central plains, bremo bluff, hawk, cohasset, whiteville and grays siding. A tornado watch remains in effect until midnight edt for central virginia. 4/15/2018 7:41 PM EDT The severe thunderstorm warning for western prince edward county will expire at 745 pm edt, the storms which prompted the warning have moved out of the area. therefore the warning will be allowed to expire. however gusty winds and heavy rain are still possible with these thunderstorms. a tornado watch remains in effect until midnight edt for central virginia. to report severe weather, contact your nearest law enforcement agency. they will relay your report to the national weather service in wakefield. 4/15/2018 7:24 PM EDT At 723 pm edt, severe thunderstorms were located along a line extending from amherst to tower hill to near hixburg to near keysville, moving northeast at 50 mph (radar indicated). Hazards include 60 mph wind gusts. Expect damage to trees and powerlines. locations impacted include, farmville, hampden sydney college, longwood university, hampden sydney, darlington heights, prospect, briery creek lake, tuggle, briery, allens mill, kingsville, elam and worsham. A tornado watch remains in effect until midnight edt for central virginia. 5/27/2017 5:29 PM EDT At 529 pm edt, a severe thunderstorm was located near jetersville, or 9 miles north of crewe, moving east at 35 mph (radar indicated). Hazards include ping pong ball size hail and 60 mph wind gusts. People and animals outdoors will be injured. expect hail damage to roofs, siding, windows, and vehicles. expect wind damage to trees and powerlines. this severe thunderstorm will be near, jetersville and morven around 535 pm edt. amelia courthouse around 545 pm edt. chula around 550 pm edt. scotts fork and spainville around 555 pm edt. mannboro around 600 pm edt. Other locations impacted by this severe thunderstorm include north wellville, prince edward station, angola, earls, ammon, twin lakes state park, winterham, darvills, church road and skinquarter. 5/27/2017 5:13 PM EDT At 513 pm edt, a severe thunderstorm was located near rice, or 9 miles east of farmville, moving southeast at 45 mph (radar indicated). Hazards include 60 mph wind gusts and quarter size hail. Minor damage to vehicles is possible. expect wind damage to trees and powerlines. this severe storm will be near, morven around 520 pm edt. jetersville around 525 pm edt. Other locations impacted by this severe thunderstorm include raines tavern, angola, rodophil, mcrae, moran, giles mill, hawk, paineville, maplewood and reeds. 5/27/2017 4:43 PM EDT At 442 pm edt, a severe thunderstorm was located near sheppards, or 8 miles southwest of dillwyn, moving east at 35 mph (radar indicated). Hazards include 60 mph wind gusts and quarter size hail. Minor damage to vehicles is possible. expect wind damage to trees and powerlines. this severe thunderstorm will be near, farmville around 455 pm edt. longwood university and guinea mills around 500 pm edt. rice around 510 pm edt. morven around 525 pm edt. jetersville around 530 pm edt. Other locations impacted by this severe thunderstorm include raines tavern, angola, rodophil, mcrae, moran, giles mill, hawk, paineville, maplewood and reeds. 5/5/2017 6:06 AM EDT The severe thunderstorm warning for northwestern mecklenburg, cumberland, prince edward, northwestern lunenburg, nottoway and western amelia counties will expire at 615 am edt, the storms which prompted the warning have weakened below severe limits, and no longer pose an immediate threat to life or property. therefore the warning will be allowed to expire. 5/5/2017 5:50 AM EDT At 549 am edt, severe thunderstorms were located along a line extending from near sheppards to near green bay to near rehoboth, moving northeast at 45 mph (radar indicated). Hazards include 60 mph wind gusts. Expect damage to roofs, siding, and trees. these severe storms will be near, burkeville and guinea mills around 555 am edt. crewe around 600 am edt. cumberland, jetersville and sunnyside around 605 am edt. blackstone, nottoway and morven around 615 am edt. Other locations impacted by these severe thunderstorms include tuggle, angola, arvins store, nutbush, finneywood, hawk, fairview, plantersville, elam and pleasant grove. 5/5/2017 5:27 AM EDT At 526 am edt, severe thunderstorms were located along a line extending from near darlington heights to near kells corner to near redoak, moving northeast at 50 mph (radar indicated). Hazards include 60 mph wind gusts. Expect damage to roofs, siding, and trees. severe thunderstorms will be near, darlington heights around 530 am edt. hampden sydney, hampden sydney college and prospect around 535 am edt. farmville, longwood university, rehoboth and green bay around 545 am edt. victoria, lunenburg, burkeville and guinea mills around 555 am edt. crewe around 600 am edt. cumberland, jetersville and sunnyside around 605 am edt. blackstone and nottoway around 615 am edt. Other locations impacted by these severe thunderstorms include tuggle, angola, arvins store, nutbush, finneywood, hawk, fairview, plantersville, elam and pleasant grove. 2/25/2017 1:48 PM EST At 148 pm est, a severe thunderstorm was located near green bay, or near hampden sydney college, moving northeast at 65 mph (radar indicated). Hazards include 60 mph wind gusts and half dollar size hail. Hail damage to vehicles is expected. expect wind damage to roofs, siding, and trees. this severe thunderstorm will be near, crewe around 155 pm est. jetersville around 200 pm est. morven around 205 pm est. amelia courthouse and scotts fork around 210 pm est. chula and macon around 215 pm est. powhatan and moseley around 220 pm est. tuckahoe, bon air, manakin and sabot around 230 pm est. Other locations impacted by this severe thunderstorm include crozier, prince edward station, briery, pilkinton, twin lakes state park, winterham, skinquarter, maplewood, fine creek mills and fergusonville. 7/27/2016 5:48 PM EDT At 547 pm edt, a severe thunderstorm was located near rice, or 7 miles east of farmville, moving east at 25 mph (radar indicated). Hazards include 60 mph wind gusts and nickel size hail. Expect damage to roofs. siding. and trees. this severe thunderstorm will be near, crewe and jetersville around 610 pm edt. amelia courthouse around 625 pm edt. other locations impacted by this severe thunderstorm include angola, rodophil, denaro, stoddert, maplewood, fergusonville, winterham. Truxillo, hawk and jennings ordinary. 2/24/2016 4:54 PM EST At 454 pm est, doppler radar indicated a severe thunderstorm capable of producing a tornado. this dangerous storm was located near green bay, or near hampden sydney college, moving northeast at 50 mph. this dangerous storm will be near, burkeville and rice around 500 pm est. crewe around 505 pm est. other locations impacted by this tornadic thunderstorm include burkes tavern, oliveville, simplicity, virso, stoddert, prince edward station, twin lakes state park, prince edward lake, briery creek lake and briery. 2/24/2016 4:41 PM EST At 440 pm est, doppler radar indicated a tornado. this dangerous storm was located over keysville, and moving northeast at 50 mph. * this dangerous storm will be near, hampden sydney college around 450 pm est. green bay around 455 pm est. burkeville and rice around 500 pm est. crewe around 505 pm est. other locations impacted by this tornadic thunderstorm include burkes tavern, oliveville, simplicity, virso, stoddert, tuggle, kingsville, prince edward station, twin lakes state park and prince edward lake. 2/24/2016 4:28 PM EST At 428 pm est, doppler radar indicated a severe thunderstorm capable of producing destructive winds in excess of 80 mph. this storm was located near drakes branch, or near charlotte court house, and moving northeast at 65 mph. * this severe thunderstorm will be near, hampden sydney college and green bay around 450 pm est. crewe, burkeville and rice around 455 pm est. other locations impacted by this severe thunderstorm include allens mill, burkes tavern, oliveville, virso, tuggle, kingsville, prince edward station, twin lakes state park, prince edward lake and briery creek lake. a tornado watch remains in effect until 900 pm est for south central virginia. 2/24/2016 3:51 PM EST At 350 pm est, doppler radar indicated a tornado. this dangerous storm was located over red house, and moving northeast at 55 mph. * this dangerous storm will be near, darlington heights around 355 pm est. prospect around 405 pm est. other locations impacted by this tornadic thunderstorm include tuggle, allens mill and elam. 8/11/2015 3:59 PM EDT At 359 pm edt, doppler radar indicated a severe thunderstorm capable of producing quarter size hail and damaging winds in excess of 60 mph. this storm was located over longwood university, and moving east at 30 mph. * this severe thunderstorm will be near, rice around 410 pm edt. green bay around 415 pm edt. burkeville around 425 pm edt. crewe around 430 pm edt. jetersville around 435 pm edt. nottoway around 440 pm edt. other locations impacted by this severe thunderstorm include burkes tavern, oliveville, tuggle, stoddert, kingsville, maplewood, prince edward station, twin lakes state park, prince edward lake and briery creek lake. 7/13/2015 10:49 PM EDT At 1049 pm edt, doppler radar indicated a line of severe thunderstorms capable of producing damaging winds in excess of 60 mph. these storms were located along a line extending from rice to near boydton, moving east at 30 mph. these severe storms will be near, burkeville around 1100 pm edt. south hill and crewe around 1110 pm edt. nottoway and la crosse around 1115 pm edt. other locations impacted by these severe thunderstorms include burkes tavern, nelson, bacons fork, buffalo junction, briery creek lake, arvins store, loves mill, elam, scholfield and keats. 7/13/2015 10:11 PM EDT At 1011 pm edt, doppler radar indicated a line of severe thunderstorms capable of producing damaging winds in excess of 60 mph. these storms were located along a line extending from near toga to near hitesburg, and moving east at 35 mph. * severe thunderstorms will be near, boydton around 1035 pm edt. south hill and la crosse around 1100 pm edt. other locations impacted by these severe thunderstorms include burkes tavern, nelson, bacons fork, buffalo junction, briery creek lake, arvins store, loves mill, elam, scholfield and keats. 6/20/2015 7:09 PM EDT At 708 pm edt, doppler radar indicated a line of severe thunderstorms capable of producing damaging winds in excess of 60 mph. these storms were located along a line extending from near longwood university to 6 miles east of chase city, moving northeast at 50 mph. 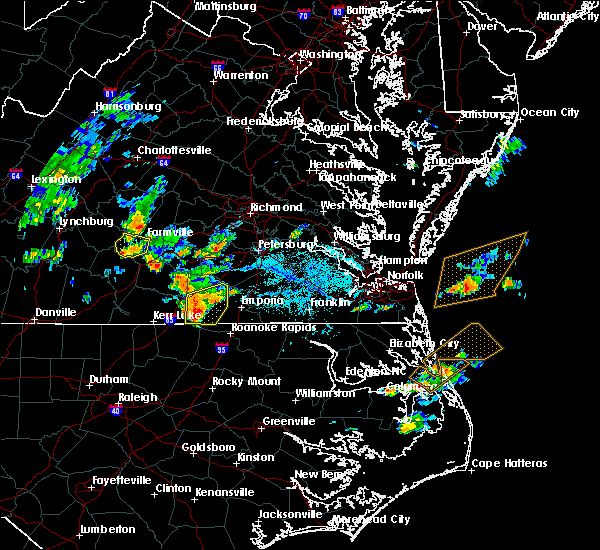 these severe storms will be near, farmville, longwood university and rice around 715 pm edt. guinea mills around 720 pm edt. victoria and lunenburg around 725 pm edt. kenbridge, sunnyside and morven around 730 pm edt. other locations impacted by these severe thunderstorms include angola, rodophil, burkes tavern, briery creek lake, loves mill, arvins store, scholfield, hawk, mcrae and worsham. 6/20/2015 6:48 PM EDT At 647 pm edt, doppler radar indicated a line of severe thunderstorms capable of producing damaging winds in excess of 60 mph. these storms were located along a line extending from abilene to near clarksville, and moving northeast at 50 mph. * severe thunderstorms will be near, darlington heights around 655 pm edt. 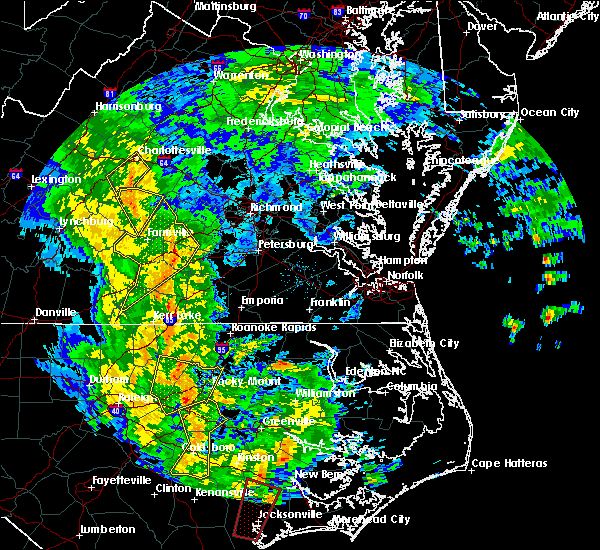 hampden sydney college and hampden sydney around 700 pm edt. 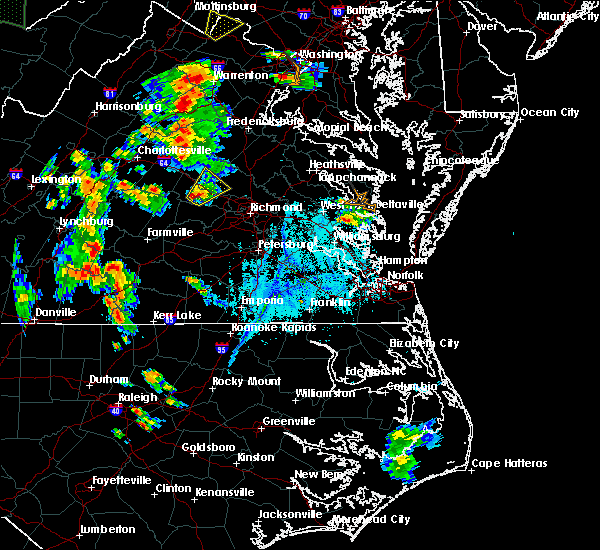 farmville, chase city and longwood university around 705 pm edt. rice and kells corner around 710 pm edt. rehoboth around 715 pm edt. guinea mills around 720 pm edt. lunenburg around 725 pm edt. victoria, kenbridge, sunnyside and morven around 730 pm edt. other locations impacted by these severe thunderstorms include angola, rodophil, burkes tavern, nelson, bacons fork, buffalo junction, briery creek lake, arvins store, loves mill and scholfield. 6/18/2015 5:29 PM EDT At 528 pm edt, doppler radar indicated a severe thunderstorm capable of producing quarter size hail and damaging winds in excess of 60 mph. this storm was located near rice, or 7 miles southeast of longwood university, moving southeast at 35 mph. locations impacted include, farmville, longwood university, hampden sydney, hampden sydney college, rice, green bay, burkes tavern, virso, kingsville, prince edward station, twin lakes state park, prince edward lake, briery creek lake, briery, worsham and moran. 6/18/2015 5:11 PM EDT At 509 pm edt, doppler radar indicated a severe thunderstorm capable of producing quarter size hail and damaging winds in excess of 60 mph. this storm was located near prospect, or near hampden sydney, moving southeast at 30 mph. it will pass near or just south of farmville around 520 pm edt. locations impacted include, farmville, longwood university, hampden sydney, hampden sydney college, rice, green bay, prospect, darlington heights, allens mill, burkes tavern, virso, tuggle, stoddert, kingsville, prince edward station, twin lakes state park, prince edward lake, briery creek lake, briery and elam. 6/18/2015 4:47 PM EDT At 446 pm edt, doppler radar indicated a severe thunderstorm capable of producing quarter size hail and damaging winds in excess of 60 mph. this storm was located near hixburg, or 9 miles east of appomattox, and moving southeast at 30 mph. 5/11/2015 10:35 PM EDT At 1034 pm edt, doppler radar indicated a severe thunderstorm capable of producing quarter size hail and damaging winds in excess of 60 mph. this storm was located near hampden sydney, and moving southeast at 10 mph.